Should a new Vikings stadium be ‘woman friendly’? 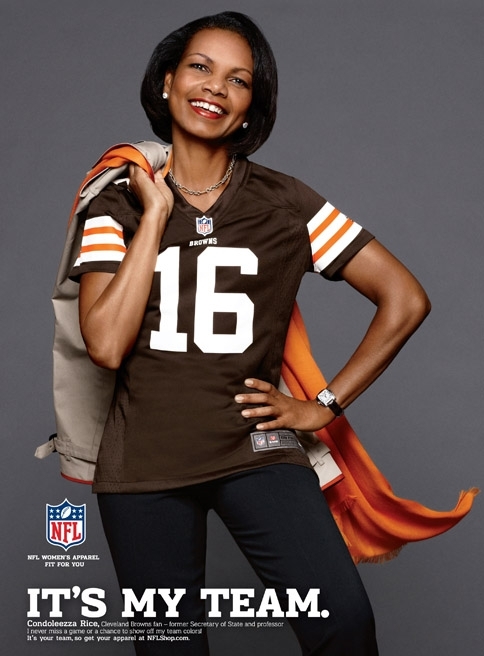 Former Secretary of State Condoleezza Rice in her Cleveland Browns jersey in an NFL print ad. An article in the Atlantic today raises an interesting question: has the time come for better gender balance at NFL stadiums? Commentator Shawnee Barton says the NFL needs to move beyond lingerie with NFL logos, pink jerseys and co-branding at Grand Central Station fashion shows. She wants a better stadium. She cites the NFL’s new bag policy, in particular, suggesting it is borderline discriminatory and little more than “security theater.” (A term coined by Minnesota-based security guru Bruce Schneier, no less.) But she also has some other suggestions, like offering some family-friendly access to the facility and keeping a better lid on bad behavior in the stands. The Vikings have already talked about the potty-parity issue, promising better restroom experience for female fans than the long lines at the Metrodome, but Barton suggests more toilets alone may not be enough. But then again, how many people are really going to bring their toddler to an NFL game through a stroller-friendly entrance? The very sexist assumptions this article makes and the gender roles it is built on are pretty ironic.